"Turned down by NBC -- either by [David] Sarnoff directly or by [Sylvester] Weaver -- Roy ended his workday earlier than he had planned and returned to his room at the Waldorf Astoria. Later that day, he called Leonard Goldenson at the underdog network, ABC -- a network that both Walt and Roy initially had perceived as being less able to help with Disneyland than either CBS or NBC. "Beyond ABC, Disney had no real possibilities. There was a fourth national network, the DuMont Network, but by 1953, it was already in the early stages of its death throes and therefore not a viable option. "Roy told him that he was in New York. At the Waldorf, to be exact.
" 'I'll come right over,' Goldenson replied. "For the past two years, Goldenson had been looking for a way to better compete with NBC and CBS, both of which enjoyed a substantially larger list of affiliate stations and therefore more viewers and higher advertising revenue than ABC. In 1953, NBC had sixty-three primary stations (a combined total of affiliate stations plus those it owned-and-operated), CBS thirty, ABC fourteen, and DuMont a paltry six, only three of which were true affiliates. Because of this, Goldenson was interested in­ -- or at least curious about -- a possible commitment with the Disney brothers for both the park and the TV show, not only to compete with the more successful networks but also to save his company from a DuMont-like failure. From conversations with an ABC executive named David Wallerstein, Goldenson already knew a few things about Walt's amusement park before his meeting with Roy and had cautiously expressed interest in a possible Disney-ABC deal. 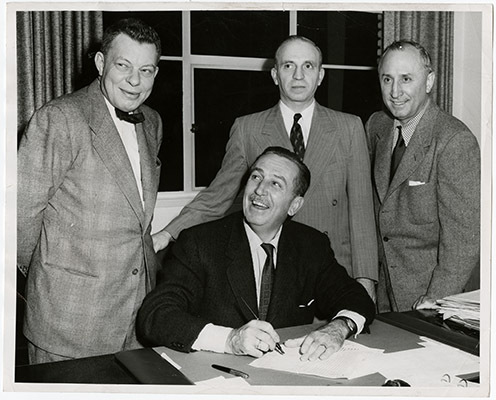 Walt Disney (seated) and (left to right) American Broadcasting Company President, Robert E. Kintner, Sidney M. Markley, ABC-PT Vice President and Roy O. Disney, President of Walt Disney Productions, sign deal in which Disney agrees to produce a series of television programs for ABC.
" 'How much is Disneyland going to cost?' he asked Roy, who sat opposite him in a dimly lit room, as waiters cleared their lunch plates. "Even with those astronomical numbers, Goldenson was not deterred, sensing that this might be his one chance to bring cinema-quality entertainment to his struggling network. He believed his best chance to catch-up with the other networks was to incorporate familiar movie personalities, such as ani­mated characters from the Disney studio library, into ABC's programming. He nodded and signaled the barkeep with a pair of fingers to bring another round. He knew that the Dis­ney offer had been turned down by the other two networks, and from friends in finance, understood that banks would not underwrite an amusement park without ample security. 'ABC,' he later wrote, 'was really Disney's last hope.'" "Though Goldenson never publically acknowledged this, Dis­ney was also ABC's last, best hope as well. "Over the next two days, Roy developed a handshake deal with Goldenson. Though the terms were not yet solidified, the two men agreed that ABC would make a direct investment in Walt's park and also guarantee financing to finish its con­struction. In the initial agreement, ABC would find a way to guarantee $2.5 million in construction loans for the comple­tion of Disneyland, though that amount was quickly raised to almost $5 million. Exactly how ABC would guarantee $5 million of financing outside of the usual circle of investment bankers remained a significant problem. In return, ABC would become a part owner of Disneyland and receive a weekly program for their network, produced twenty-six times each year."